62 Commercial Real Estate and Properties in Nsw South Coast are listed in 8 categories. We have 60 Industrial Warehouses for Sale , 15 Development Lands for Sale , 14 Retail Shops for Sale , 5 Offices for Sale , 1 Other Commercial Properties for Sale and 1 Medical and Consulting Properties for Sale . This modern development is located within the Center Of Unanderra's industrial Precinct. Located within close proximity to Port Kembla Harbour and Wollongong CBD. Easy access to the distributor going both North South. Just over 1 Hour and 15 Minutes from Sydney CBD. Units ranging from 30.82 Sqm to 359.87 Sqm Multiple options of design with or with Office/Mezzanine space, all having their own exclusive parking and roller door access. The site will also house a Cafe/Take away shop to accommodate the Complex. Modern Tilt Up Construction Full Semi Trailer Access Secure Complex High Clearance in Workshop Flexible Unit Size Available Expected Completion 2020 EXCHANGE ON AS LITTLE AS 2.5% DEPOSIT Call Today for more details. Hurry won't last!!! This modern development is located within the Center Of Unanderra's industrial Precinct. Located within close proximity to Port Kembla Harbour and Wollongong CBD. Easy access to the distributor going both North South. Just over 1 Hour and 15 Minutes from Sydney CBD. Units ranging from 30.82 Sqm to 359.87 Sqm Multiple options of design with or with Office/Mezzanine space, all having their own exclusive parking and roller door access. The site will also house a Cafe/Take away shop to accommodate the Complex. 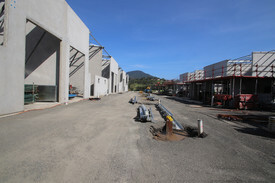 Modern Tilt Up Construction Full Semi Trailer Access Secure Complex High Clearance in Workshop Flexible Unit Size Available First Stage tilt up Jan/Feb 2019 Expected Completion Feb/March 2020 EXCHANGE ON AS LITTLE AS 2.5% DEPOSIT Call Today for more details. Hurry Wont Last!!! Modern tilt up design Mezzanines available Various sizes from 145sqm to 330 sqm Two street access High roof door clearance Completion July 2019 Large vehicle friendly Call now for more information! Modern tilt up design Mezzanines available Various sizes from 96sqm to 330 sqm Two street access High roof door clearance Large vehicle friendly Completion July 2019 Call now for more information! Modern tilt up design Exchange on 5% Mezzanines available Various sizes from 96sqm to 330 sqm Two street access High roof door clearance Large vehicle friendly Completion July 2019 Call now for more information!!! 2 Street access Massive potential for re build Ideal site for modern factory units High demand area Busy wholesale retail district Call now to inspect!!! !